Since its inception in 1920, AWNA strives to be the kind of organization envisaged by its founders; To provide a cohesive link for industry members and to help those members build a sustainable advertising customer base. Providing information and services to improve member productivity and cost-effectiveness. Representing the industry's views and positions to regulatory authorities and government. Advocating the industry's interests to all concerned. Source: Associations in Canada - Future Impact and Influence, Donald Belfall, 1995, 2001. Promote a greater awareness of its industry and members. Market and promote AWNA’s community newspaper medium. Provide educational opportunities for members and staff. Be a communication and service link between members and advertisers, agencies and government. People make the difference. That is why staff morale is high and member participation is strong. There is evident pride among the members, and our image in the industry is very positive. Member satisfaction levels and standards remain consistently high. As an association, we emphasize the importance of education in personal growth. Our seminars and workshops focus on the implementation of meaningful events designed to enhance the abilities of our members. Our annual conventions offer additional opportunities to share information and have fun. Our weekly newsletter, Keeping Up To Date, provides a communication link on timely industry and member information. Entrepreneurial spirit. Many of our members approach their daily business with a grassroots attitude. We respect and reflect member values. We realize the necessity of integrity in both product and business dealings. As innovators in an evolving medium, our strong communication network allows us the freedom to try new ideas, and the joint resources to make them a reality on behalf of our members. Affiliation with other organizations. Our association has concentrated on building quality relationships over the years with counterpart organizations across Canada, government agencies and advertisers. This has helped us to enhance member benefits and keep us current with trends in the industry. It has also established our image as one of leadership, commitment and involvement. This is a convenient advertising placement service provided by the AWNA central office. Single source placement saves time and money for our clients. For specifics, see section on advertising. Our staff prepares the necessary insertion orders, collects the digital tearsheets from an online archive and provides electronic tearsheet packages to clients. Members are guaranteed payment for their ads, as AWNA handles all client collections. Ad Leads and Commission to Member Newspapers - The AWNA will split its service fee 50/50 with member newspapers that place advertising through the AWNA or lead results in an ad placement. AWNA also actively markets both display and blanket classified advertising on behalf of members. Members receive a 35% finder’s fee on all ads forwarded to AWNA. This finder’s fee is applied to the total cost of the ad. See section on advertising for specifics. AWNA’s Value Ad Network gives the advertiser small-space campaign access to remnant space in member newspapers at cut-rate prices. All members’ newspapers are obliged to carry Blanket Classified advertisements and up to five business card-sized advertisements each week on behalf of the AWNA at no charge, except in cases where the subject matter of a particular advertisement does not conform, in its wording or form, to the policy of the member newspaper. Members receive a 25% finder’s fee on all ads forwarded to AWNA. This finder’s fee is applied to the total cost of the ad. Online Archive: The AWSOM Archive is a service created by the Alberta Weekly Newspapers Association and allows member newspapers to build a digital archive of their newspaper editions. Tearsheets and clips: The Association has created a database linked to searchable PDF files that allow these newspapers to provide customers with a number of new services. Chief among these are the provision of digital tearsheets and digital clips. The AWSOM Archive gives users an accurate, searchable database and delivers the content on screen in a PDF-viewer format. 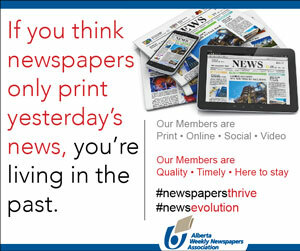 Digital subscriptions: Newspapers can also now deliver digital subscriptions, offer electronic access to their archives and provide reproductions of articles and pictures. Press release distribution: Alberta Weekly Newspapers Association (AWNA) can post your press release accessible to all member newspapers within hours of receiving your order. UPS Members Benefit Program to save on a variety of UPS services. Members receive 30% off small package shipments, 25% off imports, at least 70 % off freight shipments over 150 lb. and more. Discounts on Lenovo PC products, accessories, warranty service upgrades & more. Coordinating seminars/meetings, and our annual convention and newspaper symposium for members. Industry surveys and market research pertinent to your area. Involvement in awards, scholarships and community enrichment. Programs:Centralized Information Collection and Distribution Network. Job placement service via AWNA web site. The Press Council is an independent, voluntary body that serves to protect the public’s right to full, fair and accurate news reporting. As a non-judicial, non-governmental review board, the Press Council considers complaints from the public about the conduct and performance of Alberta’s weekly and daily newspapers. The Press Council encourages the highest ethical and professional standards of journalism. It serves to preserve the freedom of the press and to provide a forum for greater understanding and communication between the press and the public. Not all community Newspapers are created equal. The Alberta Weekly Newspapers Association sets and follows through with a set of high standards for membership.